Subcomandante Marcos, Mexico’s masked rebel figure who was one of the frontmen Zapatista uprising in the Mexican state of Chiapas in 1994, is famous for always wearing a black ski mask. The aim of the mask, allegedly, was anonymity, and an expression of the principle that “todos somos Marcos” — which translates as “we’re all Marcos.” But if it was anonymity he was after, the use of the mask has achieved quite the opposite effect, turning Marcos into a rebel icon for many, at home and abroad. The nickname Marcos is taken from the name of a friend who was killed at a military checkpoint in the road. It is not, as is sometimes presumed, an acrostic combining the names of the communities where the EZLN first rose in arms: Las Margaritas, Amatenango del Valle, La Realidad, Comitán, Ocosingo, and San Cristóbal. 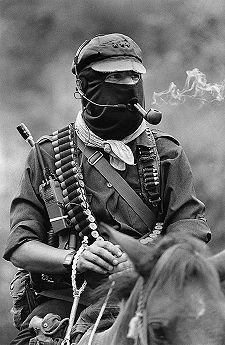 Subcomandante Marcos, also known as Insurgente Marcos and Delegado Cero, is the anonymous spokesperson of the Zapatista Army of National Liberation, based in Chiapas, Mexico. The name Subcomandante Marcos is believed to be an acronym that makes reference to some of the first locations where the army started their fight. 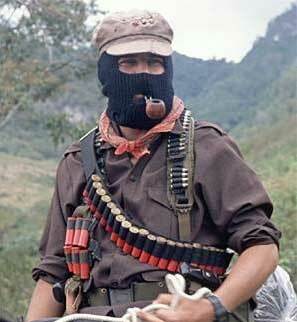 Subcomandante Marcos has made clear in different occasions that he is not the leader of the Zapatistas, but rather a supporter. The army, consisting mainly of indigenous Mayans, also counts with the support of white rural workers and sympathizers who understand the plight of the locals . The Zapatistas believe in non-violent protest, and make active use of peace marches and the Internet to share their message. They oppose globalization and fight for the autonomy of the native population of Mexico. Subcomandante Marcos has also widely campaigned against the World Trade Organization and the economic sanctions imposed by the United States on worldwide markets. 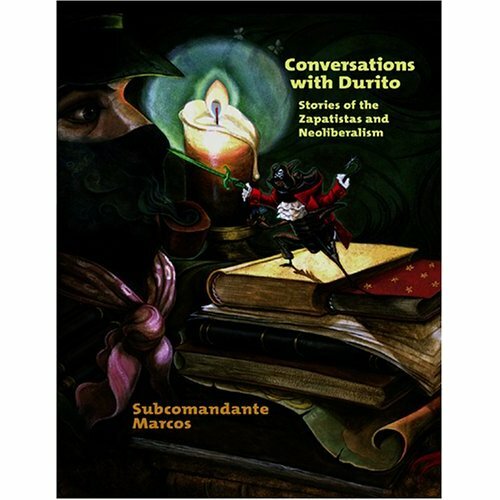 Since 1996, Subcomandante Marcos has written 21 books, some of which have gone on to be printed in numerous editions and translated into several languages. La Historia de los Colores / The Story of Colors, a bilingual edition of one of his most famous books, is actually a retelling of an old Mayan children’s fable that speaks of tolerance and solidarity. 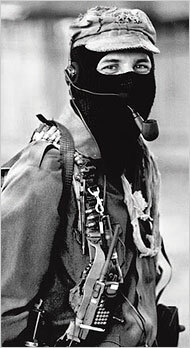 Subcomandante Marcos is also an avid correspondent, having written more than 250 stories and essays directed to newspapers and magazines, or used as press releases. In 2005, Subcomandante Marcos announced a two-part plan called “The Other Campaign.” While the creation of the plan coincided with Mexico’s presidential election the following year, the aim of the Zapatistas is not to back any particular candidates. Instead, they request a new national constitution that emphasizes equality and guarantees that public resources will not be sold to private powers. Since the beginning of “The Other Campaign,” Subcomandante Marcos has been traveling Mexico in search of supporters while addressing the issue of poverty and oppression. Of all the Mexicans one might have recognized prior to arriving here, Subcomandante Marcos – or Delegado Cero as he now prefers to be known – is definitely one of them. His image abroad as the mask-wearing, pipe-smoking mestizo who fights for the indigenous cause rivals that of another Latin American icon, Ernesto “Che” Guevara. That it is hard to nail down the facts about Marcos adds to his enigma. It’s generally accepted that he is (or was) Rafael Sebastián Guillén Vicente, born in Mexico to Spanish immigrants and educated in a Jesuit school in Tampico, Tamaulipas. Marcos denies this. Guillén, a middle-class academic who graduated from the Metropolitan Autonomous University (UAM), went on to earn a master’s degree in philosophy at the National Autonomous University of Mexico (UNAM), where he worked briefly as a professor before, allegedly, leaving Mexico City to embrace the indigenous cause. The seductive persona of the jungle-dwelling revolutionary clad in combats and battered brown cap lends itself to the romantic idolatry often favored by Latin America. His abilities as both speechmaker and raconteur are legendary. This verbosity has resulted in stacks of both children’s books and ‘adult’ novels. In a recent interview with British newspaper The Guardian, Marcos confessed to occasionally letting the fame go to his head. But those who know him say his intelligence and sense of humor keep his ego in check. Some say his mask is a strategy for anonymity though it has achieved something of the opposite. “Todos Somos Marcos” – the Zapatista slogan – signals the sense of solidarity generated within the movement; behind their masks the Zapatistas are no one and everyone. But the powerful image may exaggerate Marcos’ relevance, which is a matter of opinion and debate. His importance is rumored to be waning. This peculiar stunt of a detective novel is a collaboration between the Spanish-born Mexican writer Paco Ignacio Taibo II and, of all people, the Zapatista leader Subcomandante Marcos, that pseudonymous rebel luminary whose rakish pipe juts in photographs from what must be Earth’s most fashionable balaclava. By Paco Ignacio Taibo II and Subcomandante Marcos. Translated by Carlos Lopez. 268 pp. Akashic Books. Paper, $15.95. Taibo is, among other things, the proprietor of a long-running detective fiction series starring a soulful, one-eyed Mexico City investigator named Héctor Belascoarán Shayne. “The Uncomfortable Dead” is a Belascoarán novel that Taibo and Marcos wrote in alternating chapters, whipsawing the manuscript between, presumably, Mexico City, where Taibo lives, and Marcos’s rather more nebulous Chiapas mountain address. The book tells two converging stories. In the first, written by Marcos, a Zapatista bumpkin named Elías Contreras travels to Mexico City; he is following up leads about what will turn out to be a plot to privatize and sell off a valuable piece of southern Mexican territory that was seized from its indigenous inhabitants. In the second, written by Taibo, eerie phone messages are left for one of Belascoarán’s clients. They purport to be from a leftist activist who was murdered, supposedly by a government agent, in 1971. Contreras and Belascoarán, a man who likes his cigarettes and Coca-Cola, buddy up in the process of confounding the seizure of land and identifying the killer. This kind of material — evoking the legacy of the Mexican government’s “dirty war” against its leftist opponents — might have generated interesting genre fiction. But “The Uncomfortable Dead” reads like a gimmick. The problem is mostly with Marcos, whose chapters ramble on at almost twice the length of Taibo’s. The subcomandante, who isn’t a first-time author — his other books include some political volumes and a children’s book called “The Story of Colors” — is simply not a talented fiction writer; it’s sometimes hard even to know what his sentences mean. Marcos does manage to write some lyrical and intelligent passages. But his prose, in this translation by Carlos Lopez, can be hyperactive; he’s like a sophomore impressed by his own facility. This is a shame, because Taibo’s chapters are written with skill and wit. He does his best to evoke what he calls the “jungle” of Mexico City, that polluted sprawl haunted by history’s phantoms. But Marcos, the aggressive politician, takes control of the novel. It’s like watching Thelonious Monk being shoved off the stool by a thumping fellow in a mask. Taibo should have known better. It’s one thing to write fiction informed by your own supple leftism. It’s another to use the conventions of noir — that morally opaque genre trafficking in an all-pervasive turpitude — in the service of a cut-and-dried worldview. “The Uncomfortable Dead” is thoroughly overdetermined. Of course it was agents of the Mexican establishment who killed the activist in question. A familiarity with Mexican history makes that certain. So does the fact that the novel was partly written by a leftist insurgent. Given the context, who else might have done it? The West German Greens? Andrey Slivka, a writer based in Kiev, has written for The New Yorker, The New York Times Magazine and other publications. Brothers and sisters of Mexico and the world, who are gathered in Cancun in a mobilisation against neo-liberalism, greetings from the men, women, children and elderly of the Zapatista National Liberation Army. It is an honour for us that, amid your meetings, agreements and mobilisations, you have found time and place to hear our words.The world movement against the globalisation of death and destruction is experiencing one of its brightest moments in Cancun today. Not far from where you are meeting, a handful of slaves to money are negotiating the ways and means of continuing the crime of globalisation. That is what this is all about. It is war. A war against humanity. The globalization of those who are above us is nothing more than a global machine that feeds on blood and defecates in dollars. We hope the death train of the World Trade Organization will be derailed in Cancun and everywhere else.